Is Solar Thermal a Viable Solution for a Future Renewable Energy System? Solar thermal integration might in some situations be counter-beneficial for a renewable transition, especially when considering an energy system supplied by high shares of renewable energy. This is one of the conclusions from a study performed by Aalborg University as part of SHC Task 52 on Solar Heat and Energy Economics in Urban Environments. 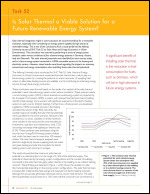 This conclusion was reached by performing a series of energy system analyses under various conditions of four national energy systems in Germany, Austria, Italy and Denmark. The solar thermal potentials were identified for each country today and in a future energy system converted to 100% renewable sources in the heating and electricity sectors. However, mixed results were found regarding the impacts on economy, environment and energy consumption when installing these solar thermal potentials.